My great-great-uncle Raymond is a hot mess. At least that’s what kids these days might say about him if they, like me, were trying to unravel the workings of his life. I first “met” Raymond Young – or, rather, I first became better acquainted with him – while researching the family lines of my great-grandmother, his sister Opal (Young) (Porter) Everett, and her family’s Mayflower ties. However, getting to know Raymond hasn’t been easy. He’s proven himself to be an artful character to say the least. Often to find Ray, I’ve sort of had to “look the other way” when it comes to getting to know him. In truth, he has become more like a friend to me than a line in my current research project – a friend with a bunch of old secrets well past the time for telling. Raymond seemed destined to become nearly an also-ran in his own family tree. Born 2 December 1894 at El Dorado in Butler County, Kansas, he was a toddler when his mother Mary (Neff) Young died. His father, George Alfred Young, widowed and with six children, quickly remarried a Miss Betty Lee Taylor. However, the new Mrs. Young wanted no part in raising George’s youngest boy. …Raymond Young Neff looks to have been a credit to both of his family names. You see, subsequent vital records show that he seems to have forgotten that he was ever married at all. In looking at those three marriages, indeed, how could I really be sure that I had the right Raymond Young Neff? Between me and you, I like to think that Raymond got it right the fourth time – around the time he married the widow Hildur (Camb) Coffman. 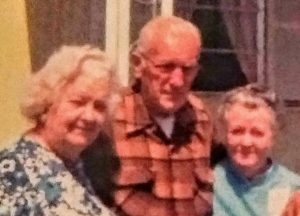 Accounts in The Times Standard of Eureka, California reflect these two were veritable senior love birds. To this I’ve got to say “good job,” Raymond – very cool. 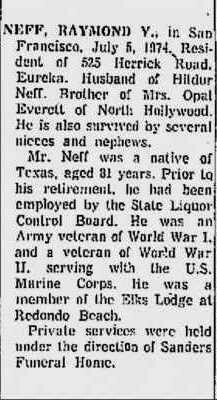 Indeed, it is to this last Mrs. Neff that I owe some genealogical gratitude. 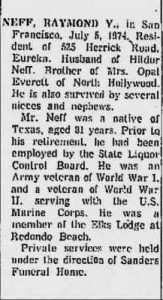 You see, in his obituary, the fourth Mrs. Neff summarizes much about Raymond’s life – right down to his not so truthful “Texas” birthplace, and all the while helping Old Ray keep up with a few of those fibs. And while Mrs. Neff may not have had all the facts, she repeats enough of “the story” that Raymond “Tex” Neff told throughout the years that I’ve been able to rewind the hot mess that was “Uncle Raymond,” tying him back to his sister and, yes, even the Mayflower – and pulling together all of the fact and fiction in the life of Raymond Young Neff. Opal (Young) (Porter) Everett (1895–1978). Mary Neff (1864–1898) married George Alfred Young 27 March 1884. 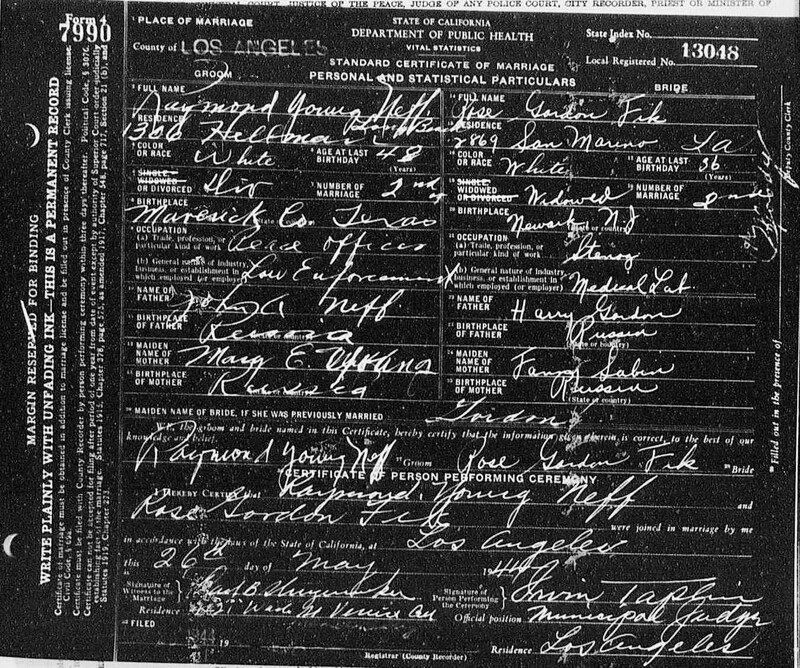 Betty Lee Taylor (1870–1952) married George Alfred Young 18 May 1899. El Dorado Republican, 20 June 1913, p. 2, at Newspapers.com. The Walnut Valley Times, 17 December 1917, p. 1, at Newspapers.com, for his marriage announcement to Sarah E. Marcum. U.S. Federal Census Records, El Dorado, Butler County, Kansas, 1930 and 1940, show Mrs. Sarah Neff and son Jack living in her parents’ household. 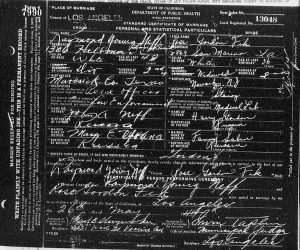 California, County Birth, Marriage, and Death Records, 1849-1980, Ancestry.com. 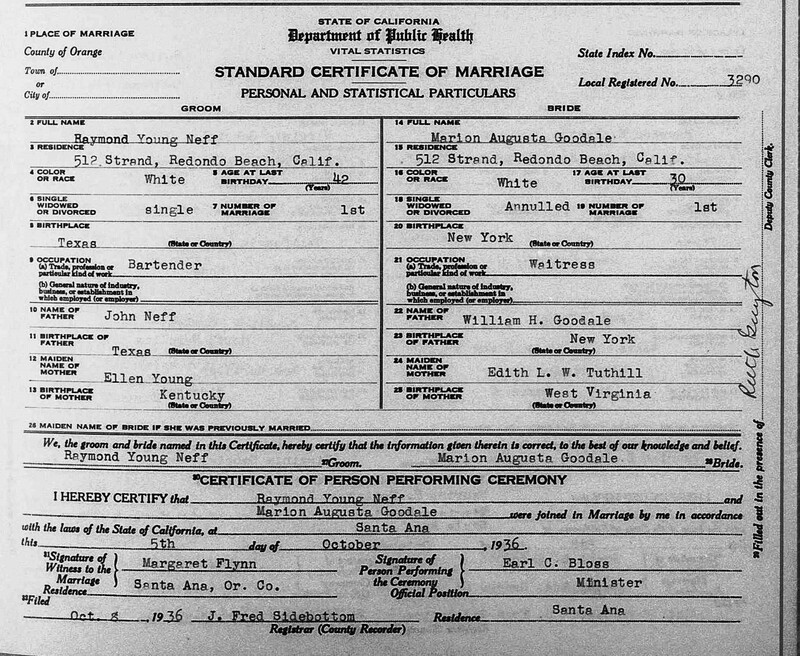 Marion Augusta (Goodale) Peters states in her marriage license application that her first marriage was annulled. Rose (Gordon) (Fik) (Neff) Daudistel (1907–1985). The Times Standard, Eureka, California, 7 July 1974, p. 27, at Newspapers.com for obituary of Raymond Y. Neff. The Times Standard, 18 November 1971, p. 23, at Newspapers.com for wedding announcement to Hildur Coffman. The Times Standard, 16 September 1971, p. 13, at Newspapers.com. Jeff, you definitely win the “Slipperiest Relative” sweepstakes. My maternal grandmother had a brother and a couple of cousins that held that distinction in my family, but none of them hold a candle to your Uncle Ray! That said, a collateral line on my dad’s side, the Penticos, is full of Neffs and Youngs that were in Kansas for a time on their way to CA, OR and WA, but if there’s a connection to Raymond, it’d be so far back in Pennsylvania to be of no consequence now. Just found it interesting to see those two surnames together again. Great bit of detective work you did here! Always enjoy reading your posts as your writing is so engaging. You’re a great story-teller. And, I have another way of thinking about my own brick wall – a great grandmother who was an unwed mother and her daughter who went to live with another family eventually assuming their surname. What a challenging relative to say the least! I particularly like how you laid out the documentation for this one because many lesser experienced researchers might have been stymied by the contradictions. In researching a friend’s Mayflower line, his errant grandfather had four wives. At least one of the marriages was bigamous, and since the fourth wife was 20 years younger, the groom deducted some ten years from his age to meet her halfway. Thus, the age on his death certificate does not match the birth certificate. “Messy documentation.” I think it’s time we push ahead, present the information, which is more than sufficient to establish the link between generation. This also gives me the opportunity to tell you how I always appreciate the feedback you give me on my posts. There are many that I want to go back and read again. Wishing you a bright new year filled with wonder. 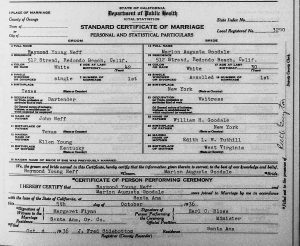 Were there divorce records for the later marriages? Also what is the Mayflower connection? My daughter-in-law descends from John Alden and Priscilla Mullins. Thank-you for asking! 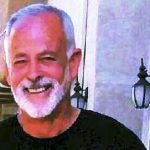 No luck with any divorce records thus far – just his statements on the marriage license applications. He connects to Mayflower passengers John Howland, Richard Warren, and Steven Hopkins. Thanks for the reply. He relates through Hopkins to Katherine Baughman runner up to Miss America in 1969. she didn’t get it because her parents were divorced. She was in the very first first grade class I taught 63 years ago and we have been in touch all these years. She designs fancy purses which sell for thousands to the Hollywood set. China began making knock offs and she sued and won using a law her Webster ancestor wrote. She was married to James Henderson a prominent Federal attorney who took on the mob in California. he just died this past summer. I am still researching to see if she is related to my daughter-in-law of the Aldens. it is a small world once you work on your genealogy-I now find Mayflower families married into my mother’s family! Excuse any typos but when I go to correct i lose the whole message.